Stewart Payne doesn’t just read to children; he brings books to life. Children love his style of read alouds, and through him, learn to love reading. We wish we could clone Mr. Stewart. 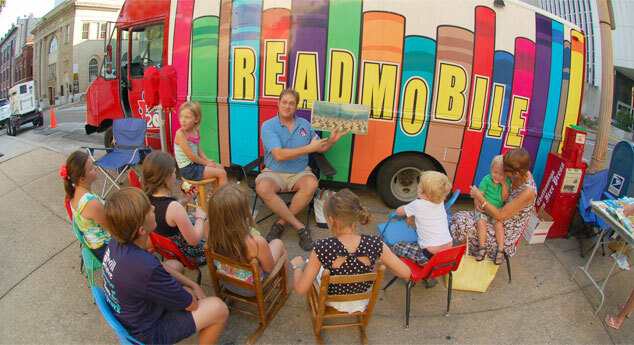 Stewart Payne has been Read 20′s Readmobile Coordinator since the program’s inception in 2008. He is the proud father of two adult sons currently attending The University of Tennessee – Knoxville.. He is an avid mountain biker, disc golfer, outdoor enthusiast, and musician with a passion for the arts, education, and organizational development. Stewart holds both Bachelor of Arts and Doctor of Jurisprudence Degrees from the University of Tennessee and has worked extensively in Chattanooga’s nonprofit sector as a programmer, administrator and fundraiser since 1999. You can reach Mr. Stewart through email: stewartp@hamiltontn.gov or by leaving him a voice mail on his cell phone at (423) 443-2527 (look for a return call in the afternoon, after he completes his “read-a-book gigs” with the students across Hamilton County!) . We are proud to have Mr. Stewart on our staff. He is a popular favorite with many students throughout Hamilton County and beyond, as he is unlike any reader you have experienced. Call us at Read 20 to schedule a “read aloud visit” .